Part of being a truck driver is understanding the risks of the job. As you probably know, truckers must constantly be aware of other drivers, road obstructions, traffic signals, and weather patterns while driving. But there’s one major risk you may not be aware of, and that’s the threat of skin damage. Have you seen the image of a driver with 28 years worth of skin damage that went viral a few years ago? If that’s not enough to scare you into following these sun protection tips for truck drivers, then I don’t know what is. Did you know that even minimal sun exposure can cause significant damage to your skin over time? 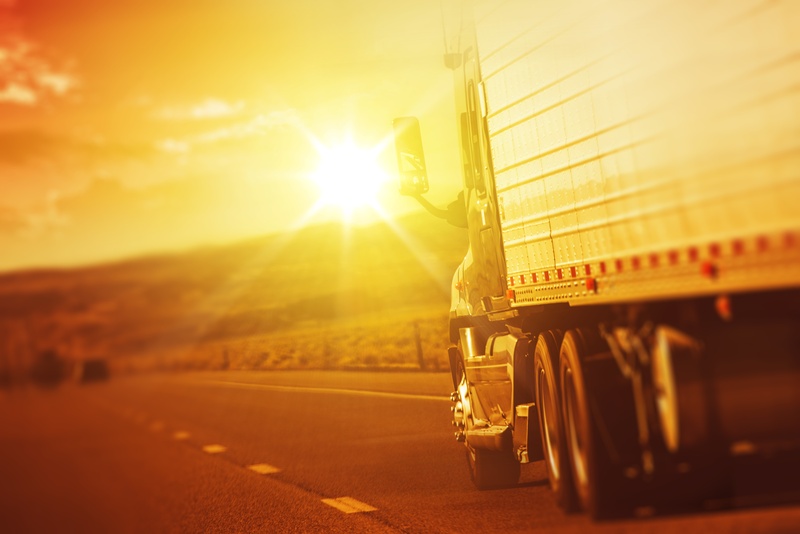 As an American truck driver, the side of your body that sees the most sun is your left, so you should focus on protecting this area the most. Some visible effects of sun exposure include freckles, spider veins, and skin spots. The texture of your skin may also change due to overexposure, making it feel more coarse or even leathery. Too much sunlight causes the collagen in your skin to deteriorate, which further prevents your skin from creating new collagen to repair itself. Your skin is your body’s largest organ, so it’s important to take care of it while you’re on the road. Even if you’ve already noticed some of these side effects, it’s not too late. Here are four sun protection tips for truck drivers that will help you save your skin and prevent further damage! It’s important to wear sunscreen whenever you’re exposing yourself to sunlight. As strange as it may seem, this includes the time you spend in your cab. Your windows may filter out the sun’s UVB rays, but they do nothing to stop the more harmful UVA rays from pouring through. We suggest that you use broad-spectrum sunscreen because it protects your skin from both types of solar radiation. You should definitely use your judgment based on the strength of the sun and the time of day your driving, but starting with an SPF 30 sunscreen is generally enough to keep your skin safe. You should also reapply your sunscreen if you go for a walk during one of your breaks. The sun’s rays are at their strongest between 10 a.m. and 2 p.m. We know that many of you can’t avoid driving during this time, so make sure you’re really taking care of your skin during these hours. Try to take walks and breaks during the early morning or evening hours, but if you do go outside make sure you reapply your sunscreen and stay in the shade as much as possible. A simple way to protect yourself from the sun’s harmful effects is to wear clothes that shield your skin. In the summer months, try to wear long-sleeved shirts, long pants, and hats that cover your face and neck. This method does help, but you still need to apply sunscreen to any exposed areas like your face, ears, and even your hands. Don’t be someone who overlooks eye care when it comes to sun protection in your truck. Even if you jump into a tub of sunscreen, it still won’t do anything to protect your eyes. To avoid any damage, you should invest in a pair of sunglasses that block both UVA and UVB rays (yup, just like that sunscreen). Wrap-around sunglasses are also great for protecting both your eyes and the skin around them. Having good eyes is essential for truck drivers, so do everything you can to protect them! Now that you know the top four sun protection tips for truck drivers, you’re ready for your next assignment! Good luck and drive safely, everyone!